Book a cheap private taxi or bus from Malaga airport to Sierra Nevada with our transfer services filling in the form on the top. Distance to Malaga: 179 km. Travel time: 2 h and 20 min. Up to -10ºC some nights. 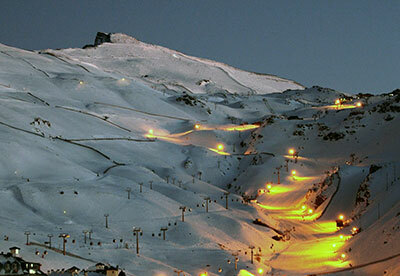 The Sky resort of Sierra Nevada is located in the Cordillera Penibetica mountain ranges of Andalusia, in the province of Granada and a few miles from other provinces like Malaga or Almeria. The peaks of Mulhacen and Veleta are part of this mountainous area, both exceeding 3.300 metres in height; the Mulhacen reaches 3,480 meters, which is considered one of the highest peaks of Europe. How to get to Sierra Nevada? Perhaps it is the most economical, but as disadvantage we have to say that it is the most restrictive, since it is subject to schedules which cannot satisfy you if you’re looking to enjoy Sierra Nevada and the city of Granada for as long as you please. It’s a great option if you want to have the freedom to choose your travel times. See the map to your right: From Malaga airport to Sierra Nevada, getting there as easy and fast as possible. Maybe renting a car and driving yourself to the mountains of Sierra Nevada is not an idea that will seduce you; therefore we offer the perfect alternative with our Malaga airport taxis; we will pick you up from the airport or wherever you tell us and take you to the resort of Sierra Nevada; similarly, we will pick you up and bring back to Malaga. 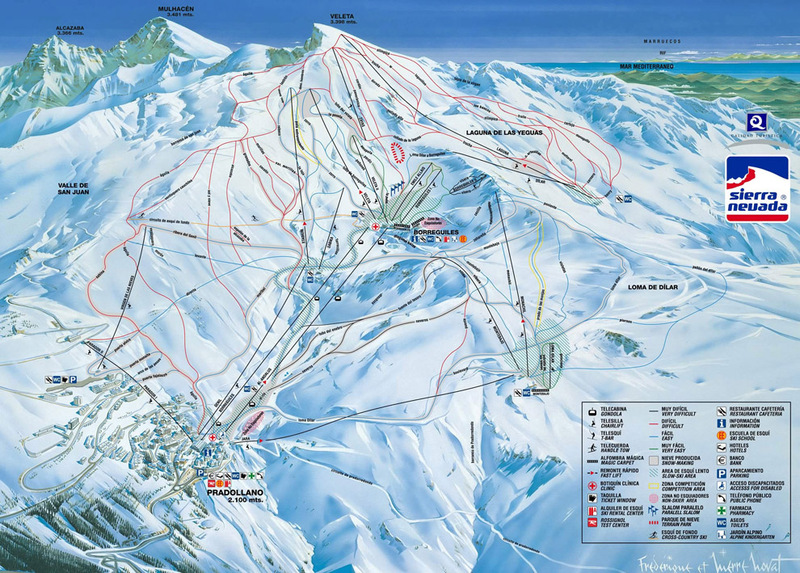 EconomyTransfer provides two videos of the tracks of this ski station. Pradollano is the centre of the resort, where you will arrive after traveling by bus or car, which houses all rental shops for snow accessories, ski and snowboard, restaurants, cafes, ski pass purchase, hotels, and generally all service establishments that you may require. Learn more about our low cost transfer services to provide a good way of transport to the Sierra. 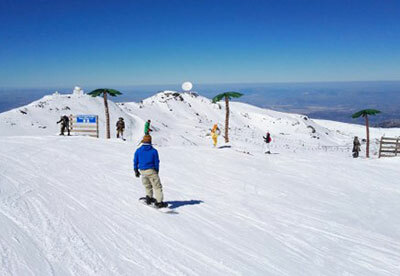 Skiing is one of the most practiced winter sports in Sierra Nevada, and thanks to the variety of slopes you can practice cross-country skiing, downhill skiing, skiing with snowblades, freestyle skiing and of course you can hire a teacher who will get you started with the practise in the beginners area of Borreguiles. 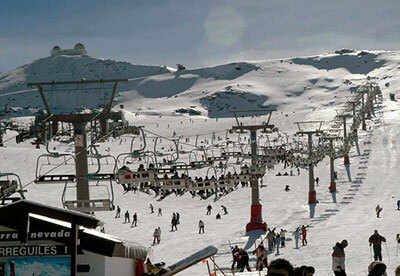 Snowboard: This is another favourite sport and visitors of Sierra Nevada greatly enjoy this activity. As with the case of skiing, in the resort are available courses and instruction for beginners in snowboarding and classes for all levels. Snowmobiles: There are also offered guided tours guided tours in these vehicles, a unique experience that is becoming increasingly popular. Ice Skating: An ecological and artificial rink to practice ice skating, which is highly recommended for children. The rink is situated in the area of Mirlo Blanco, next to Pradollano. Recreational Area Mirlo Blanco: It provides alternatives of fun in the snow suitable for visitors with less skill or curious people willing to try new forms of entertainment. Here you can enjoy: Slides, chair-ski, Russian sled, bike-slalom, mini-snow, mini-ski, archery and other activities that will appeal to small and young visitors. High Performance Centre: Many amateur and professional athletes are exercising at this centre. Practising sport at this height provides a special benefit that is very attractive to these athletes. Night skiing: For many skiers this is the best time of day when the slopes are empty, the lights are lit and from 7 pm to 9.30 pm you can ski at night, under the moonlight and stars. The requirement is to purchase a special ski pass; it is also worth mentioning that night skiing is available only some Saturdays of the season depending on weather conditions. Hiking Trails: Last not least, during summer or winter you have the possibility to complete various hiking trails located in different areas of the mountain ranges. 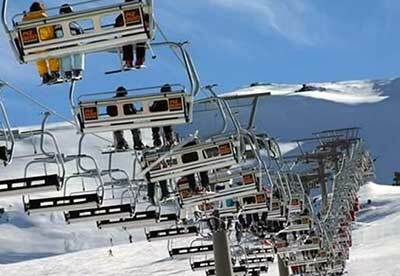 Do not hesitate and get the best service of transport to get comfortably and safely to the ski resort of Sierra Nevada, and learn more about the best andalucia destinations.